Inspired by Marie Antoinette’s majestic and intricate harp, the Harper antique silver crystal crown is exquisite with its regal undertones yet hints at a dark romanticism. This magnificent crown is the perfect piece to nestle into a romantic updo or down hairstyles alike. It creates an enchanting and fashion-forward statement for the modern bride. The Harper crown is finished with an abundance of exquisite crystal details and empire blue accents that are reminiscent of the finishes in the Palace of Versailles. The empire blue details add a subtle “something blue” but can be substituted with silver crystal details upon request. Featuring Swarovski crystals, brass components. The Harper crystal wedding crown is made to order. Please allow 4-6 weeks for production plus delivery times. 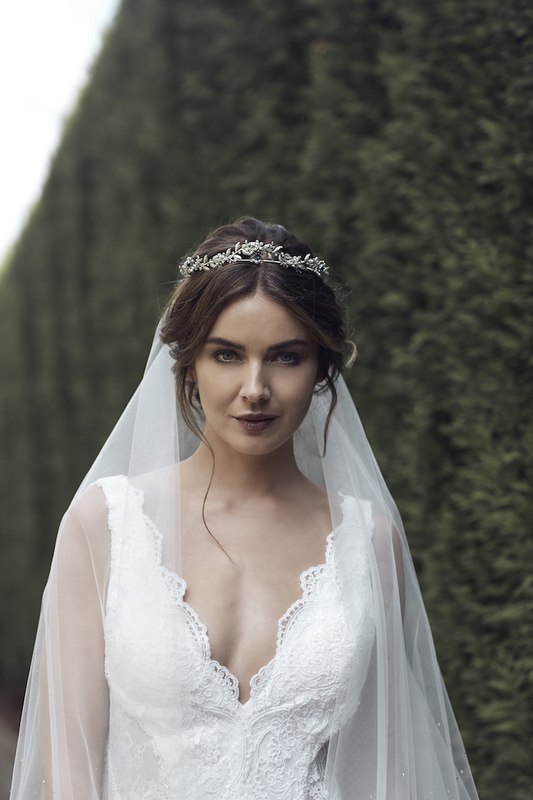 For a look that’s wildly romantic and chic, we love to style the Harper crown with a statement crystal encrusted veil such as our Etoile and Margaux veils for maximum effect. If you’d prefer something that’s a little more understated, the Harper crown pairs beautifully with the Rosella raw edge veil or the Audrey veil for the minimally inclined. Browse our full veil collection or contact us and we’d be happy to offer a recommendation based on your wedding dress and hairstyle. Please note: the empire blue crystal details add a subtle “something blue” but can be substituted with silver crystal details upon request.